Discover GLO Science Teeth Whitening with Dynamic Dental Work in Queens! In a lifetime, we will consume many things that dull the whiteness of our smiles. Fortunately, teeth whitening has become a popular method for brightening tooth enamel and contributing to a smile’s overall appearance. 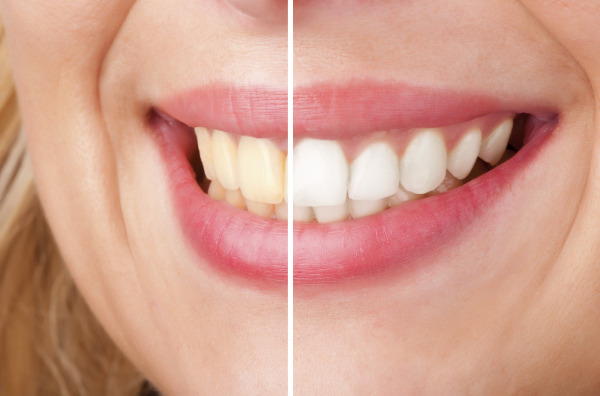 In our Queens dental office, we use the latest in dental technology and modern dental practices, and we are proud to offer the innovative GLO Science Teeth Whitening System for patients looking for an efficient and comfortable way to whiten their teeth. The GLO Science Teeth Whitening System creates long-lasting results and even allows users to continue their whitening outside of the dentist’s chair! What is the GLO Science Teeth Whitening System? The GLO (or guided light optics) Teeth Whitening System uses a gel mixture and a gentle LED light to lighten tooth enamel. The system consists of an in-house whitening treatment and a subsequent take-home whitening kit that creates an easy way for busy patients to treat their teeth. Because patients are able to take home a whitening kit, the GLO Whitening System has proven to have longer lasting results than other methods. The system is also gentler and results in less tooth sensitivity once the treatment is complete. A patient using the GLO Science Teeth Whitening System will experience one chairside whitening session and then receive a take-home kit that includes a mouth piece housing LED lights and heat resistors. A whitening gel is applied to the teeth, and then the mouth piece placed in the mouth, which activates the gel and lightens the tooth enamel. The take-home kit can be used throughout the day and can be used for up to two months. Before scheduling your whitening appointment, we will perform a dental examination to make sure there is no wear on your teeth. The chairside whitening will only take thirty minutes and will lighten your teeth up to five shades. Once the in-office treatment is complete, you will be given your take-home whitening kit along with instructions for its use. At Dynamic Dental Work, we provide a variety of cosmetic dentistry procedures, including teeth whitening, for the improvement of your smile’s aesthetic. For more information or to schedule an appointment, contact our Queens dental office today!